What better way to warm up the look of your space than with beautiful window treatments by Hunter Douglas, Graber, Kirsch, or Norman Window Coverings? With the holidays and chilly weather around the corner, now is the time to invest in great window treatments for your home. What better way to warm up the look of your space than with beautiful window treatments by Hunter Douglas, Graber, Kirsch, or Norman Window Coverings? At Columbia Paint, there are so many excellent window treatment brands to choose from that are sure to enhance the design of your home this fall instantly. 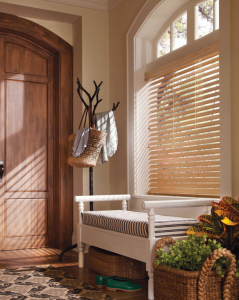 While your windows are useful for bringing the light of the outdoors in, window treatments play an important role in maintaining the privacy of your home. If you love to let the light in your living room, bedroom, or dining area, choose a window treatment that will maximize the natural lighting of the room. If you prefer more shade in your space, there are plenty of more versatile window treatments that are perfect for keeping a room dark and cool throughout the year. Not only do window treatments help to provide privacy within your home, but they also complete the overall look of a room. Use your window treatments as key decorative pieces in any room of your home with plenty of styles and color options to choose from for your project. As you select the perfect window treatments for your home, the overall look and style of your space will appear to be complete as a space that is all your own. When it comes to interior design, your style doesn’t stop at your paint and decor. Let the right window treatments for your home be a showcase of your style with a unique look for each room. As you select a window treatment style for your home, consider the style, colors, and textures provided by each of our brands. If you need assistance with choosing your perfect window treatment, our professionals at Columbia paint are ready to help you with your decision along the way!